Cities: Capital: Copenhagen (pop. 538,031 in Copenhagen and 1,697,490 in the Capital Region, October 2010). Other cities — Aarhus (310,653), Aalborg (198,501), Odense (190,147). Nationality: Noun — Dane(s). Adjective — Danish. Annual population growth rate (2010): 1%. Ethnic groups: Scandinavian, Inuit, Faroese, Turkish, German, Polish, Iraqi, Lebanese, Bosnian, Pakistani, Yugoslav (former), Somali, Iranian, Vietnamese, British, Afghan-. Religious membership: Danish National Evangelical Lutheran Church 80.7%; Muslim about 4%. Other — majority consisting of Protestant denominations and Roman Catholics; also 19 Muslim, 3 Jewish, 6 Buddhist, and 8 Hindu religious communities recognized by the state. Education: Years compulsory: 9. Attendance — 100%. Literacy — 99%. Health*: Infant mortality rate (2009) — 3.6/1,000. Life expectancy — men 76.5 years, women 80.8 years. Work force* (2010, third quarter): 2.69 million. Employment: Industry, construction, and utilities — 20%; government — 33%; private services — 44%; agriculture and fisheries — 3%. Branches: Executive: queen (head of state), prime minister (head of government), cabinet. Legislative — unicameral parliament (Folketing). Judicial — appointed Supreme Court. Political parties (represented in parliament): Venstre (Liberal), Social Democratic, Danish People's, Social Liberal, Socialist People's, Unity List, Liberal Alliance, Conservative. GDP (2010): $310.3 billion (current prices and exchange rates; source: Government of Denmark). Annual growth rate (real terms, 2010): 2.1%. Per capita GDP (2010): $58,500 (current prices and exchange rates). Agriculture, fisheries, and extractive industries (4.5% of GDP, 2010): Products: meat, milk, grains, seeds, hides, fur skin, fish and shellfish. Industry (19.1% of GDP, 2010): Types: industrial and construction equipment, food processing, electronics, chemicals, pharmaceuticals, furniture, textiles, windmills, and ships. Natural resources: North Sea: oil and gas, fish. Greenland — fish and shrimp, potential for hydrocarbons and minerals, including zinc, lead, molybdenum, uranium, gold, platinum. The Faroe Islands — fish, potential for hydrocarbons. Trade (2010, goods): Exports: $96.744 billion: industrial production/manufactured goods 73.3% (of which machinery and instruments were 21.4%, and fuels, chemicals, etc. 26%); agricultural products and others for consumption 18.7% (in 2009 meat and meat products were 5.5% of total export; fish and fish products 2.9%). Imports — $84.409 billion: raw materials and semi-manufactures 37.4%; consumer goods 17.9%; capital equipment 21.7%; transport equipment 9.7%; fuels 8.0%. Major trade partners, exports — Germany 16.8%, Sweden 13.3%, U.K. 7.8%, U.S. 6.6%, Norway 6.3%, Holland 4.4%. Major trade partners, imports — Germany 20.8%, Sweden 13.3%, Holland 7.1%, U.K. 6.0%, China 7.6%, Norway 3.9%, U.S. 3.2%. Official exchange rate (2010 average): 5.62567 kroner=U.S. $1. The Danes, a homogeneous Gothic-Germanic people, have inhabited Denmark since prehistoric times. Danish is the principal language. English is a required school subject, and fluency is high. A small German-speaking minority lives in southern Jutland; a mostly Inuit population inhabits Greenland; and the Faroe Islands have a Nordic population with its own language. Education is compulsory from ages seven to 16 and is free through the university level. Although religious freedom is guaranteed, the state-supported Evangelical Lutheran Church has a membership of 80.7% of the population. 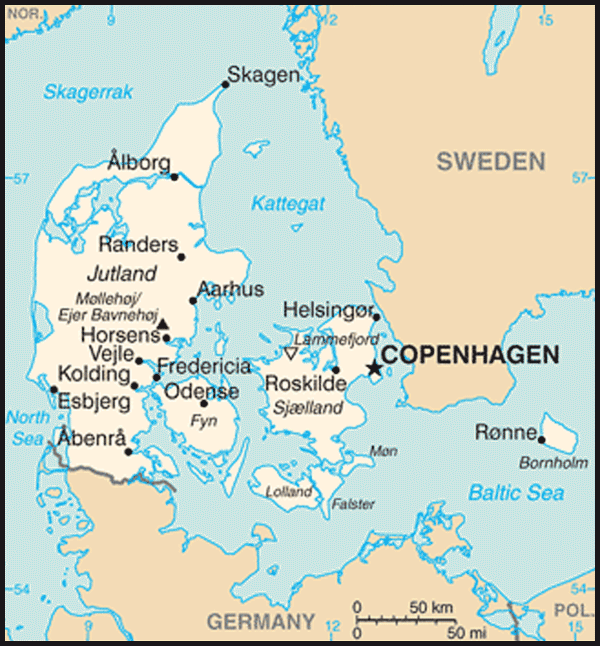 Several other Christian denominations, as well as other major religions, find adherents in Denmark. Islam is now the second-largest religion in Denmark, with the number of Muslims in Denmark estimated at 3.6% of the population. Denmark remained neutral during World War I. Despite its declaration of neutrality at the beginning of World War II, it was invaded by the Germans in 1940 and occupied until liberated by the Allied forces in May 1945. Resistance against the Germans was sporadic until late 1943. By then better organized, the resistance movement and other volunteers undertook a successful rescue mission in which nearly the entire Jewish population of Denmark was shipped to Sweden (whose neutrality was honored by Germany). However, extensive studies are still being undertaken for the purpose of establishing a clearer picture of the degree of Danish cooperation — official and corporate — with the occupying power. Denmark became a charter member of the United Nations and was one of the original signers of the North Atlantic Treaty. Denmark's rich intellectual heritage has made multifaceted contributions to modern culture. The discoveries of astronomer Tycho Brahe (1546-1601), the work of geologist, anatomist, and bishop Blessed Niels Steensen (1639-86 — beatified in 1988 by Pope John Paul II), and the contributions of Nobel laureates Niels Bohr (1885-1962) to atomic physics and Niels Finsen (1860-1904) to medical research indicate the range of Danish scientific achievement. The fairy tales of Hans Christian Andersen (1805-75), the philosophical essays of Soeren Kierkegaard (1813-55), and the short stories of Karen Blixen (pseudonym Isak Dinesen; 1885-1962) have earned international recognition, as have the symphonies of Carl Nielsen (1865-1931). Danish applied art and industrial design have won many awards for excellence, with the term "Danish Design" becoming synonymous with high quality, craftsmanship, and functionalism. Among the leaders in architecture and design was Arne Jacobsen (1902-1971), the "father of modern Danish design." Georg Jensen (1866-1935) was known for outstanding modern design in silver, and "Royal Copenhagen" is among the finest porcelains. Entertainer and pianist Victor Borge (1909-2000), who emigrated to the United States under Nazi threat in 1940 and became a naturalized U.S. citizen, had a worldwide following. The Danish Film Institute, one of the oldest in Scandinavia, holds daily public screenings of Danish and international movies in their original language and works to maintain and restore important archival prints. Movie directors who have won international acclaim include Gabriel Axel (Babette's Feast, 1987 Oscar for Best Foreign Film), Bille August (Buster's World, 1984; Pelle the Conqueror, 1988 Oscar for Best Foreign Film; The House of the Spirits, 1993), Lars von Trier (Breaking the Waves, 1996; Dancer in the Dark, 2000 Cannes Golden Palm; and Antichrist 2009, Nordic Council's Film Prize 2009), and Susanne Bier (In a Better World, 2011 Golden Globe for Best Foreign Language Film). Danes became involved early on in the "Dogma film" genre's development, in which small, hand-held digital cameras permitted greater rapport between director and actor and gave a documentary film feel to increasingly realistic works. Examples of the Dogma concept include von Trier's The Idiots (1998) and Dogville (2003, starring Nicole Kidman), Thomas Vinterberg's The Celebration (1998 Cannes Special Jury prize), Soeren Kragh-Jacobsen's Mifune's Last Song (1999 Berlin Silver Bear award), and Lone Scherfig's Italian for Beginners (2000 Berlin Silver Bear award). Mads Mikkelsen is one of Denmark's best-known actors internationally, with film roles in King Arthur (2004), Casino Royale (2006), After the Wedding (2006, which was nominated for an Oscar), and Clash of The Titans (2010). The Louisiana Museum north of Copenhagen, "Arken" south of Copenhagen, and the North Jutland Art Museum in Aalborg showcase international collections of modern art. The State Museum of Art and the Glyptotek, both in Copenhagen, contain masterpieces of Danish and international art. Denmark's National Museum building in central Copenhagen holds most of the state's anthropological and archeological treasures, with notable prehistoric and Viking Age collections; two of its best satellite collections are the Viking Ship Museum in Roskilde west of the metropolis and the Open Air Museum in a nearby northern suburb, where buildings have been transported from their original locations around the country and reassembled on plots specially landscaped to evoke the original site. The Museum of Applied Art and Industrial Design in Copenhagen exhibits the best in Danish design. The internationally-known Royal Copenhagen Porcelain Factory exports worldwide. Danish ceramic designers have included Bjoern Wiinblad, whose whimsical creations first appeared in the 1950s, Gertrude Vasegaard, and Michael Geertsen. Denmark has a number of impressive castles, many of which have been converted to museums. Frederiksborg Castle, on a manmade island in a lake north of Copenhagen, was restored after a catastrophic fire in the 1800s and features important collections and manicured gardens. Kronborg (or Hamlet's) Castle in Helsingoer (Elsinore), which once exacted tribute from passing ships, holds furniture and art collections of the period and hosts touring summer productions of Shakespearean works. Copenhagen's Rosenborg Castle, with public gardens in the heart of the city, houses the kingdom's crown jewels. For American readers, probably the best-known contemporary Danish writer is Peter Hoeg (Smilla's Sense of Snow; Borderliners). Poems by poet, novelist, playwright, and screenwriter Klaus Rifbjerg and by poet, short-story writer, and composer Benny Andersen have been translated into English by Curbstone Press. Suzanne Broegger's works focus on the changing roles of women in society. Kirsten Thorup's "Baby" won the 1980 Pegasus Prize and was printed in English by the University of Louisiana Press. The psychological thrillers of Anders Bodelsen and political thrillers by Leif Davidsen also appear in English. In music, Hans Abrahamsen and Per Noergaard are two well-known composers, and Abrahamsen's works have been performed by the National Symphony Orchestra in Washington, DC. Other international names are Poul Ruders, Bo Holten, and Karl Aage Rasmussen. Danes such as bass player Niels Henning Oersted Petersen have won broad international recognition, and the Copenhagen Jazz Festival held each year in July attracts international jazz enthusiasts. Rock and roll band Metallica's drummer, Lars Ulrich, is Danish. The Royal Danish Ballet specializes in the work of Danish choreographer August Bournonville (1805-79). Danish dancers also feature regularly on the U.S. ballet scene, notably Peter Martins as head of New York City Ballet. The Ministry of Cultural Affairs was created in 1961. Cultural life and meaningful leisure time were then and remain now subjects of debate by politicians and parliament as well as the general public. The democratization of cultural life promoted by the government's 1960s cultural policy has come to terms with the older "genteel culture;" broader concepts of culture now generally accepted include amateur and professional cultural, media, sports, and leisure-time activities. Denmark's cultural policy is characterized by decentralized funding, program responsibility, and institutions. Danish cultural direction differs from that of other countries with a Ministry of Culture and a stated policy in that special laws govern each cultural field — e.g., the Theater Act of 1990 (as amended) and the Music Law of 1976 (as amended). The Ministry of Cultural Affairs includes among its responsibilities international cultural relations; training of librarians and architects; copyright legislation; and subsidies to archives, libraries, museums, literature, music, arts and crafts, theater, and film production. During 1970-82, the Ministry also recognized protest movements and street manifestations as cultural events, because social change was viewed as an important goal of Danish cultural policy. Danish governments exercise caution in moderating this policy and practice. Radio and TV broadcasting also fall under the Ministry of Culture. Government expenditures for culture totaled just over 1.0% of the public budget in 2008 and government expenditures for culture totaled 0.33% of gross domestic product (GDP). Viewed against the government's firm objective to limit public expenditures, contributions are unlikely to increase in the future and have remained about $1.2 billion for the last couple of years. Municipal and county governments assume a relatively large share of the costs for cultural activities in their respective districts, 57% to the government's 43%. Most support goes to libraries and archives, theater, museums, arts and crafts training, and films. Large, private foundations play an important part in supporting the spectrum of cultural activities from supporting struggling young artists to paying for large-scale restoration work, operating museums, and supporting scientific research. Private organizations such as the New Carlsberg Foundation, the Velux Foundation, and the Augustinus Foundation enjoy an almost semi-public stature due to their long records of working for the public good. U.S.-style corporate sponsorship of the arts is very limited in Denmark. The 1953 constitution established a unicameral Folketing of not more than 179 members, of whom two are elected from the Faroe Islands and two from Greenland. Elections are held at least every 4 years, but the prime minister can dissolve the Folketing at any time and call for new elections. Folketing members are elected by a complex system of proportional representation; any party receiving at least 2% of the total national vote receives representation. The result is a multiplicity of parties, none of which holds a majority. Electorate participation normally is around 80%-85%. The judicial branch consists of 22 local courts, two high courts, several special courts (e.g., arbitration and maritime), and a Supreme Court of 15 judges appointed by the crown on the government's recommendation. Since a structural reform of local government was passed by the Folketing in 2004 and 2005, Denmark is divided into five regions and 98 municipalities. The regions and municipalities are both led by councils elected every 4 years, but only the municipal councils have the power to levy taxes. Regional councils are responsible for health services and regional development, while the municipal councils are responsible for day care, elementary schools, care for the elderly, culture, environment, and roads. The Faroe Islands enjoy home rule and Greenland has expanded "self-rule," with the Danish Government represented locally by high commissioners. These local governments are responsible for most domestic affairs, with foreign relations, monetary affairs, and defense falling to the Danish Government. Denmark maintains an embassy (http://www.ambwashington.um.dk/en) at 3200 Whitehaven Street NW, Washington, DC 20008-3683 (tel. 202-234-4300). Danish consulates general are located in Chicago and New York. Political life in Denmark is orderly and democratic. Political changes occur gradually through a process of consensus, and political methods and attitudes are generally moderate. Growing numbers of immigrants and refugees throughout the 1990s, and less than successful integration policies, however, have led over the last decade to growing support for populist anti-immigrant parties in addition to several revisions of already-tight immigration laws, with the latest revision taking effect August 10, 2009. However, the left-of-center government that took office October 3, 2011 has indicated it will seek to ease immigration requirements. Parliamentary elections held November 13, 2007 returned the coalition to government for another term of up to 4 years. In April 2009, after Anders Fogh Rasmussen was elected Secretary General of NATO, he was succeeded as Prime Minister by Lars Loekke Rasmussen (no relation). The coalition consisted of the Liberal Party ("Venstre") and the Conservative Party, holding 63 of 179 seats in the Folketing, and had the parliamentary support of the Danish People's Party, holding another 23 seats. Following the September 15, 2011 general election, Social Democratic Party leader Helle Thorning-Schmidt formed a three-party minority coalition government with the centrist Social Liberal Party and the leftist Socialist People's Party. The coalition controls 77 of the seats in the Folketing (SDP 44, SLP 17, and SPP 16) and enjoys parliamentary support from the 12 seats held by the far-left Unity List (aka Red-Green Alliance). The opposition Liberal Party holds 47 seats, the Danish People's Party 22 seats, the Liberal Alliance 9 seats, and the Conservative People's Party 8 seats. Denmark's role in the European Union (EU) remains an important political issue. Denmark emerged from two referenda (June 2, 1992 and May 18, 1993) on the Maastricht Treaty on the European Union with four exemptions (or "opt-outs"): common defense, common currency, EU citizenship, and certain aspects of legal cooperation, including law enforcement. The Amsterdam Treaty was approved in a referendum May 28, 1998, by a 55% majority. Still, the electorate's fear of losing national identity in an integrated Europe and lack of confidence in long-term stability of European economies run deep. These concerns were at the forefront of the September 28, 2000 referendum on Denmark's participation in the third phase of the Economic and Monetary Union (EMU), particularly the common currency, the Euro; more than 53% voted "no," and Denmark retained its "krone" currency unit. The new government has positioned itself as more openly enthusiastic about the EU than its predecessor. It has promised to hold a referendum on eliminating the defense and justice and home affairs opt-outs, replacing the latter with an opt-in agreement. Denmark is preparing to hold the EU presidency during the first half of 2012. However, the referendum will not be held before the end of the country's EU presidency. Denmark's relatively quiet and neutral role in international affairs abruptly changed when the Danish newspaper Jyllands-Posten printed 12 caricatures of Mohammed on September 30, 2005. Islamic law prohibits any visual portrayal of Mohammed, and Muslims viewed the caricatures as offensive. In early 2006 Muslims worldwide became infuriated with the Danes, began a boycott of Danish products, and burned Danish flags and the Danish embassies in Damascus and Beirut. The Danish Government sought during the crisis to defend freedom of expression even as it chastised the newspaper for insensitivity toward a religious minority. Jyllands-Posten refused to apologize but expressed regret if anybody felt offended by the cartoons. Several Danish newspapers reprinted the cartoons in a show of support of freedom of expression. The newspaper Politiken later apologized to anyone offended by its decision to reprint one of them. The Danish Government repeatedly reiterated its support for freedom of religion, but some animosity toward Denmark within the international Islamic community lingers. Denmark's industrialized market economy depends on imported raw materials and foreign trade. Within the European Union, Denmark advocates a liberal trade policy. Its standard of living is among the highest in the world, with a GDP per capita of $58,500 making Denmark the 18th richest country in the world in 2010. In 2010, Denmark devoted 0.91% of gross national income (GNI) to foreign aid to less developed countries, including for peace and stability purposes, refugee pre-asylum costs, and environmental purposes in central and eastern Europe and developing countries, making Denmark one of the few countries that are contributing more than the UN goal of 0.7% of GNI to aid. In 2011, Denmark is expected to devote a similar percentage. The new government has said it wants to raise official development assistance to 1% of GNI. Denmark is a net exporter of food and energy. Its principal exports are machinery, instruments, and food products. The United States is Denmark's largest non-European trading partner, accounting for 5.0% of total Danish goods trade in 2010. Aircraft, computers, machinery, and instruments are the major U.S. exports to Denmark. Among major Danish exports to the United States are industrial machinery, chemical products, furniture, pharmaceuticals, canned ham and pork, windmills, and plastic toy blocks (Lego). In addition, Denmark has a significant services trade with the U.S., a major share of it stemming from Danish-controlled ships engaged in container traffic to and from the United States (notably by Maersk-Line). There were 436 U.S.-owned companies operating in Denmark in 2008, not including financial service companies. Like the rest of the world, Denmark was affected by the 2008-2009 global economic crisis. Most local observers agree that Denmark is on the path to a slow recovery, with economic growth from the third quarter of 2009 onward. Gross unemployment averaged 6.0% in 2010, up from 2.7% in 2008, and is expected to average 6.2% in 2011; the average length of the unemployment period has increased. Unemployment is not anticipated to decrease before the end of 2012. Private consumption has contracted significantly and is still below pre-crisis levels. The same goes for industrial production, which was pushed to the lowest level in over a decade. Exports fell dramatically — about 20% — also due to the devaluation of trading partners' currencies, especially those of Sweden, Norway, and the U.K. In 2010 exports regained some of the loss with 10% growth; they exceeded pre-crisis levels in the spring of 2011. Export growth has led much of the recent GDP growth but has slowed in the second half of 2011 due to a slowdown in global economic activity. The government estimates GDP growth of 1.3% in 2011 and 1.8% in 2012. The budget surplus of 2008 became a deficit of $8.5 billion in 2009 (2.7% of GDP) and is forecast to be $12.6 billion in 2011 (3.8% of GDP), exceeding the 3% limit set by the Economic and Monetary Union of the EU (EMU). The 2012 estimate shows a growing deficit of $15.7 billion (4.6% of GDP), while the 2011 deficit will likely be worse than estimated. The government has proposed plans for fiscal consolidation to bring the deficit below 3% of GDP by 2013; as of January 2011, the EU Commission said that Denmark's responses to remedy the budget deficit had been adequate. Following the renewed financial turmoil in the second half of 2011, the fiscal plan may no longer be sufficient. Public debt reached 43.7% of GDP in 2010 but remains well within the 60% limit set by the EMU. It is estimated to increase to 44.4% in 2011. In addition to the global crisis, Denmark has underlying growth challenges and is projected to have one of the lowest productivity growth rates among Organization for Economic Cooperation and Development (OECD) countries in the decade to come; it dropped from sixth to twelfth place among the richest OECD nations from 1997 to 2007. Denmark is facing demographic challenges that could lead to labor supply shortages by 2015 according to some estimates. Denmark has maintained a stable currency policy since the early 1980s. The krone, formerly linked to the Deutschmark, has been pegged to the Euro since January 1, 1999. The Greek financial crisis has affected Denmark to some extent — as the Euro falls in value, the krone also falls, making Danish exports more competitive. Denmark's contribution to the EU financial support package to Greece was 1.2 billion Euro (approx. $1.6 billion). It is expected that as of 2011, Denmark will not meet the economic convergence criteria for participating in the EMU due to its public deficit rising above the allowed 3% of GDP, but the Danish Government remains committed to meeting the criteria. Prior to the Greek financial crisis, opinion polls showed a majority in favor of the EMU, but with the continued turmoil in the Euro zone, polling at the end of the third quarter of 2011 showed record high support for a "no" vote in the event of a referendum on joining the Euro zone (57% against versus 36% in favor). No referendum on the EMU/Euro is expected during the life of the current parliament, which could run until 2015, and not until polling shows a significant majority supporting Denmark's entry into the common currency. Danes are generally proud of their welfare safety net, which ensures that all Danes receive basic health care and need not fear real poverty. However, there is a growing political debate about how government policy should be reformed in order to preserve and strengthen the system. The portion of working-age Danes (16 to 66-year-olds) living mostly on government transfer payments amounts to 24% (2010). The heavy load of government transfer payments burdens other parts of the system. Health care, other than for acute needs, and care for the elderly and children have suffered, while taxes remain among the highest in the world. About one-third of the labor force is employed in the public sector. On June 21, 2009, Greenland assumed increased autonomy under a Self Rule Act, deepening the "home rule" that had been in effect since 1979. Under self rule, the Greenlandic government (Naalakkersuisut) and the Danish Government are recognized as equal partners and Kalaallisut, the Inuit dialect, becomes the official language of Greenland. The Greenland Government intends to take responsibility for additional government functions gradually, such as prisons, criminal justice, courts of law, family law, passports, and mineral resources. The Danish Government freezes its annual block grant at the 2007 level of 3.2 billion kroner ($570 million, 2010 exchange rate). That grant will be adjusted for Danish inflation, though not the often higher Greenlandic inflation, meaning the value in real terms is expected to shrink in coming years. However, Greenland gains rights to its mineral, oil, and natural gas resources: the first 75 million kroner ($13.3 million) from mineral/oil/gas revenues would go to Greenland, with further revenues split equally between the two governments, and with Denmark's share being subtracted from the annual block grant. Once the block grant is eliminated, any additional revenue would be subject to renegotiation between the Danish and Greenlandic governments. The public sector in Greenland, including publicly-owned enterprises and the municipalities, plays the dominant role in the economy and employs roughly 50% of the workforce. A large part of government revenues still comes from the Danish Government block grant — 46% in 2009. The block grant remains an important supplement to GDP. About one-third of government revenue came from taxes in 2009. Greenland's economy has been relatively unharmed by the global economic crisis. The main sources of income for Greenland are transfers from abroad, the value of fish production, and the direct and indirect effects of mineral exploration. Transfers from abroad are contained in agreements and will not be influenced by international trends, while the value of fisheries and mineral resource exploration is influenced by international economic developments. According to the Greenlandic Economic Council, real GDP is estimated (the most recent national account statistics are from 2007) to have contracted by 1.0% in 2009, followed by a recovery of 2.0% growth in 2010 and 3.0% growth in 2011. The outlook for 2012 is for zero GDP growth. The recovery was primarily driven by hydrocarbon and mineral exploration and exploitation investments, as well as high levels of construction activity in the capital Nuuk in 2010-2011 and the 2010-2011 increase in the price of fish and shrimp, Greenland's main export. The 2012 outlook is highly uncertain depending on continued exploration activities. A commercial find of hydrocarbons or minerals could add significantly to activities, while disappointments could lead to contraction. Unemployment rose in 2008-2010 after an extended period from 2003 with lower unemployment. Unemployment now seems to have stabilized at the 2010 level. Structural reforms are still needed in order to create a broader business base and economic growth through more efficient use of existing resources in both the public and the private sectors. Due to its continued dependence on exports of fish (mainly shrimp), which make up 85% of goods exports, Greenland's economy remains sensitive to foreign developments. Greenland has registered a growing foreign trade deficit since the closure of the last remaining lead and zinc mine in 1989. The trade deficit reached $391 million, or 24% of GDP, in 2010. International interest in Greenland's mineral wealth is increasing. International consortia are increasingly active in exploring for hydrocarbon resources off Greenland's western coast; in November 2010, seven exclusive licenses for exploration and exploitation of oil and gas were awarded. There are international studies indicating the potential of oil and gas fields in northern and northeastern Greenland. The U.S. Geological Survey estimates that up to 17 billion barrels of oil and gas are present in the area between Canada and Northwest Greenland. Cairn Energy carried out three exploration drillings in Greenland in 2010, the first exploration drilling in Greenland in 10 years, and discovered gas and oil-bearing sands in one of the drillings. Drilling continued in 2011 but without significant finds. The U.S. aluminum producer Alcoa in May 2007 concluded a memorandum of understanding with the Greenland Home Rule Government to build an aluminum smelter and associated power generation facility in Greenland to take advantage of abundant hydropower potential, although progress on that project has been delayed. It is estimated that, upon completion, the Alcoa investment would be worth approximately $2.5 billion. Tourism also offers another avenue of economic growth for Greenland, with increasing numbers of cruise lines now operating in Greenland's western and southern waters during the peak summer tourism season. In early 2008, the Faroese economy began to show signs of an impending slowdown. The main difficulty lay with the fishing industry coming under pressure from smaller catches combined with historically high oil prices. Reduced catches, especially of cod and haddock, strained the Faroese economy in 2008-2009. GDP grew 24% (in current prices) between 2004 and 2008 but then contracted by 0.8% in 2008 and by 1.6% in 2009. According to the Governmental Bank of the Faroes (Landsbanki Foroya), the Faroese economy changed from a downturn to growth in 2010, and it is estimated that nominal GDP increased by 3.4% in 2010. The bank predicts that there are prospects for nominal economic growth in 2011 (3.1%) and 2012 (3.5%), but developments in 2011 have brought these estimates down from 5% annually. The main drivers of growth are considerably higher output levels in the fisheries sector and expectations for increased private spending. As households gradually become secure enough to increase consumption further, revenues from tax and duties may increase faster than GDP. These economic developments would reduce government deficits to some extent. This is desirable if the public deficit is to remain at a level where the Faroe Islands can sustain economic fluctuations without losing the confidence of both citizens and international creditors. The temporary slowdown in the Faroese economy followed a strong performance since the mid-1990s, with annual growth rates averaging close to 6%, mostly as a result of increased fish landings and salmon farming and high and stable export prices. Positive economic development had helped the Faroese Home Rule Government produce increasing budget surpluses that in turn helped to reduce the large public debt, most of it to Denmark. Most of the Faroese who emigrated in the early 1990s (some 10% of the population) due to an economic recession have returned. Unemployment had been low since 2003 and practically non-existent at its lowest level of 1.2% in April 2008, but has since increased sharply, with average unemployment of 5.7% in 2010 and rising to above 7% in early 2011. Unemployment is expected to decrease slightly in 2012 as the economy improves. 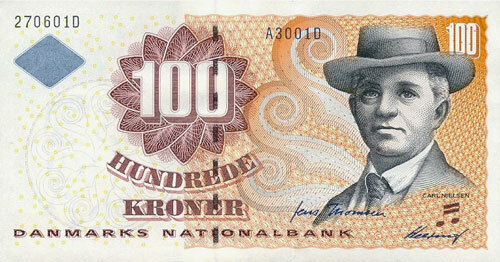 The currency of the Faroe Islands is the Foroyska kronan. However, it is not an independent currency. Faroese bank notes are Danish bank notes that feature Faroese motifs. There are no Faroese coins. Initial discoveries of oil in the Faroese area give hope for eventual oil production, which could lay the basis for a more diversified economy and thus less dependence on Danish economic assistance. Aided by an annual subsidy from Denmark corresponding to about 6% of Faroese GDP, the Faroese have a standard of living comparable to that of the Danes and other Scandinavians. Politically, the present Faroese Home Rule Government has initiated a process toward greater autonomy from Denmark, if not complete secession. In that respect, agreement on how to phase out the Danish subsidy plays a crucial role. Although Denmark remained neutral during the First World War, its rapid occupation by Nazi Germany in 1940 persuaded most Danes that neutrality was no longer a reliable guarantee of security. Danish security policy is founded on its membership in NATO. Since 1988, Danish budgets and security policy have been set by multi-year agreements supported by a wide parliamentary majority, including government and opposition parties. In 2009, Danish defense expenditures were 1.4% of GDP. Denmark has been a member of NATO since its founding in 1949, and membership in NATO remains highly popular. There were several serious confrontations between the U.S. and Denmark on security policy in the so-called "footnote era" (1982-88), when a parliamentary majority forced the government to adopt specific national positions on nuclear and arms control issues that were at variance with Alliance policy. With the end of the Cold War, however, Denmark has been an active and supportive member of the Alliance. Danish foreign policy is founded upon four cornerstones: the United Nations, NATO, the EU, and Nordic cooperation. Denmark also is a member of, among other organizations, the World Bank and the International Monetary Fund; the World Trade Organization (WTO); the Organization for Security and Cooperation in Europe (OSCE); the Organization for Economic Cooperation and Development (OECD); the Council of Europe; the Nordic Council; the Baltic Council; and the Barents Council. It is a member of the Arctic Council and chaired the organization during 2009-2011. Denmark emphasizes its relations with developing nations. It is a significant donor and one of the few countries to exceed the UN goal of contributing 0.7% of GNP to development assistance. In the wake of the Cold War, Denmark has been active in international efforts to integrate the countries of Central and Eastern Europe into the West. It has played a leadership role in coordinating Western assistance to the Baltic states (Estonia, Latvia, and Lithuania). The country is a strong supporter of international peacekeeping. Danish forces were heavily engaged in the former Yugoslavia in the UN Protection Force (UNPROFOR), as well as in NATO's Operation Joint Endeavor/Stabilization Force in Bosnia and Herzegovina (IFOR/SFOR), and currently in the Kosovo Force (KFOR). It also participates in UNIFIL (Lebanon) and has twice commanded a NATO maritime task force against piracy off the coast of Somalia. It was an early and very active participant in air operations over Libya in 2011, including ground strike missions. Danes have at times had a reputation as "reluctant" Europeans. When they rejected ratification of the Maastricht Treaty on June 2, 1992, they put the European Community's (EC) plans for the European Union on hold. In December 1992, the rest of the EC agreed to exempt Denmark from certain aspects of the European Union, including a common defense, a common currency, EU citizenship, and certain aspects of legal cooperation. On this revised basis, a clear majority of Danes approved continued participation in the EU in a second referendum on May 18, 1993, and again in a referendum on the Amsterdam Treaty on May 28, 1998. Denmark has, however, at times also shown strong leadership within the European Union, as it did during its 2002 European Union presidency, when Denmark took a lead role in successful negotiations for the EU's inclusion of 10 new members from Central and Eastern Europe. Since the September 11, 2001 terrorist attacks in the United States, Denmark has been highly proactive in endorsing and implementing United States, UN, and EU-initiated counter-terrorism measures, just as Denmark has contributed substantially to NATO's International Security Assistance Force (ISAF) in Afghanistan. It currently has about 750 soldiers in Afghanistan, operating without caveat and concentrated in Helmand province. In 2003, Denmark was among the first countries to join Operation Iraqi Freedom (OIF), supplying a submarine, a Corvette-class ship, and military personnel to support OIF's coalition in Iraq. Denmark in the end provided 500 troops to assist with stabilization efforts in Iraq. Denmark withdrew most of its troops from Iraq in August 2007, when Iraqi forces took over security responsibilities in the Basra area where Danish troops had been concentrated. Denmark maintains a small residual troop contingent that supports the NATO Training Mission in Iraq. Denmark and the United States have long enjoyed a close and mutually beneficial relationship. Denmark and the United States consult closely on European and other regional political and security matters and cooperate extensively to promote peace and stability well beyond Europe's borders. Denmark largely shares U.S. views on the positive ramifications of NATO enlargement. Danish troops support ISAF-led stabilization efforts in Afghanistan. President George W. Bush made an official working visit to Copenhagen in July 2005, and Prime Minister Anders Fogh Rasmussen also met with President Bush at Camp David in June 2006 and in Crawford, Texas in March 2008. President Barack Obama met with Prime Minister Lars Loekke Rasmussen on October 2, 2009 in Copenhagen and in December 2009 at the Copenhagen climate summit COP-15. Prime Minister Rasmussen visited President Obama in the White House on March 14, 2011. Denmark's active liberal trade policy in the EU, OECD, and WTO largely coincides with U.S. interests. There are differences of opinion between the U.S. and the EU on how to manage and resolve the global crisis, but not on the importance of action. The U.S. is Denmark's largest non-European trade partner with 5.0% of Danish merchandise trade. Denmark's role in European environmental and agricultural issues and its strategic location at the entrance to the Baltic Sea have made Copenhagen a center for U.S. agencies and the private sector dealing with the Nordic/Baltic region. American culture — and particularly popular culture, from jazz, rock, and rap to television shows and literature — is very popular in Denmark. More than 300,000 U.S. tourists visit Denmark annually. The U.S. Air Force (USAF) base and early warning radar facility at Thule, in northwest Greenland, serves as a vital link in Western and NATO defenses. In August 2004, the Danish and Greenland Home Rule governments signed agreements allowing for an upgrade of the Thule early warning radar in connection with a role in the U.S. ballistic missile defense system. The same agreements also created new opportunities for both sides to enhance economic, technical, and environmental cooperation between the United States and Greenland. The U.S. Embassy (http://denmark.usembassy.gov/) is located at Dag Hammarskjolds Alle 24, 2100 Copenhagen Ø, Denmark (tel. +45 33-41-71-00). The website contains links to U.S. Government agencies at the Embassy and provides a wealth of information on U.S.-Danish relations.